tip games, custom commands, automatic message posting, and much more. For the first time, completely in the model’s control. 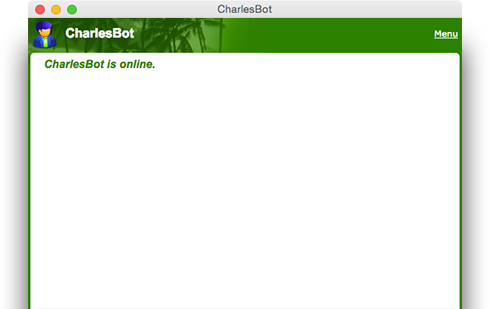 CharlesBot waits in your MyFreeCams chat room day in and day out so it can start helping you the moment you log online. Have CharlesBot automatically post advertisements in your chat, run secondary countdowns, handle super fun tip games, and much much more. CharlesBot has been built with the help and advice from multiple amazing models who have together logged well over 5,000 total hours of strict testing to ensure all models have the best experience possible. Super charge your MFC chat room and have Charles help you do great! CharlesBot was built (with tender loving care) for the sole purpose of helping models better manage their chat rooms, allowing them to focus on putting on the best show for their members. CharlesBot © 2018 | All rights reserved.